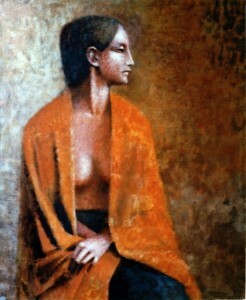 The featured painting for February 2012 is entitled “Woman Draped in Shawl”. This entry was posted on Wednesday, February 1st, 2012 at 12:01 pm	and is filed under Painting of the month. You can follow any responses to this entry through the RSS 2.0 feed. You can leave a response, or trackback from your own site. Stunning work by a gifted artist, is there any of his work out there for sale I wonder, or even to show in our gallery. Should not be forgotten here in Ireland.